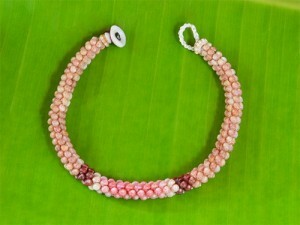 Hawaiian Shell Jewelry, Handcrafted by "Shell Dave". Unique treasures wait for you to be discovered while exploring the majestic beauty Hawaii has to offer. Be sure not to miss the captivating gifts from the ocean. Handcrafted Hawaiian Shell Jewelry by Shell Dave are definitely some of the finest gifts you can find from the oceans around Kauai. Many Hawaiian shells are indigenous to the island chain; some are not only collected, but also as rare as insurable gems. We specialize in Kahelelani and Sunrise shells. Each piece is handmade and therefore “one of a kind”. There are several designs showcased here. The “Herringbone” design is the traditional Hawaiian custom for leis. 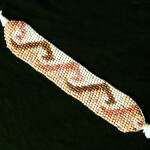 The “Rope”, and “Loom Weave” designs are both original techniques for a truly unique piece of jewelry. Kahelelani shells were made popular by the Royal Hawaiian culture of Niihau, and have now become a favorite of locals and visitors alike. Shells have been collected, and strung into leis to adorn royalty and to be worn at special ceremonies, such as weddings and funerals. 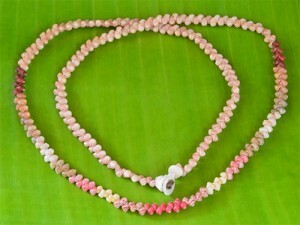 Kahelelani shell lei were given to the deceased as a final Aloha to their loved ones. Now they are donned for every occasion and treasured for their natural beauty. Even though island of Niihau is inaccessible to the public, Kahelelani and Sunrise shells may also be found on various beaches throughout the island chain. Sunrise shells are richly colored and probably the most rare and collectable of all Hawaiian shells. Few people in the world will have the opportunity to experience these unique treasures. They are a blessing to discover, and an honor to share. 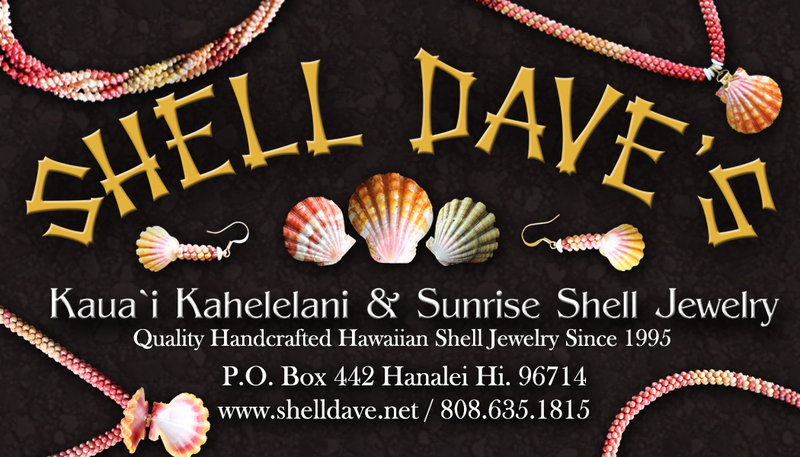 There are many vendors of Hawaiian Shell Jewelry, but only one Shell Dave. When buying from Shell Dave, you are getting over 20 years of experience, quality, and reputation to go with your one of a kind jewelry. Shell Dave only uses pristine, flawless shells, and top quality materials for his work. When you buy from Shell Dave, you are sure to have a quality piece of art you will enjoy for many years.